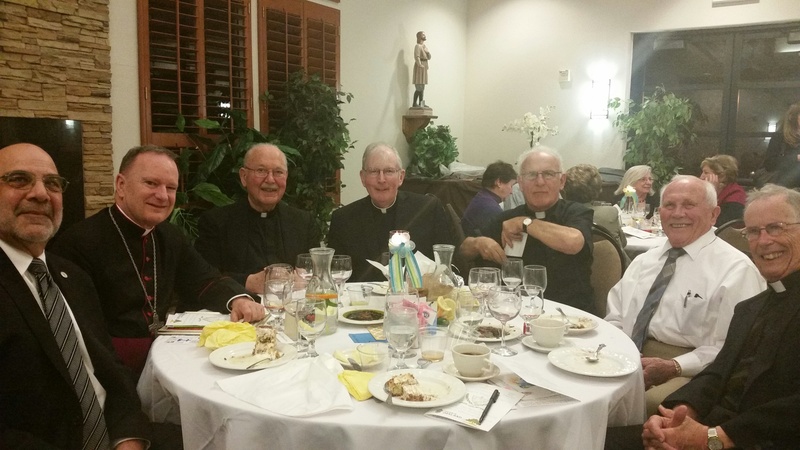 On Thursday we had a Campaign reception dinner at St. Bonaventure in Concord. I went back on Sunday for two Masses, and two receptions: one in English and one in Spanish. Thanks to Fr. Mangini and his outstanding leadership staff for making all the arrangements. 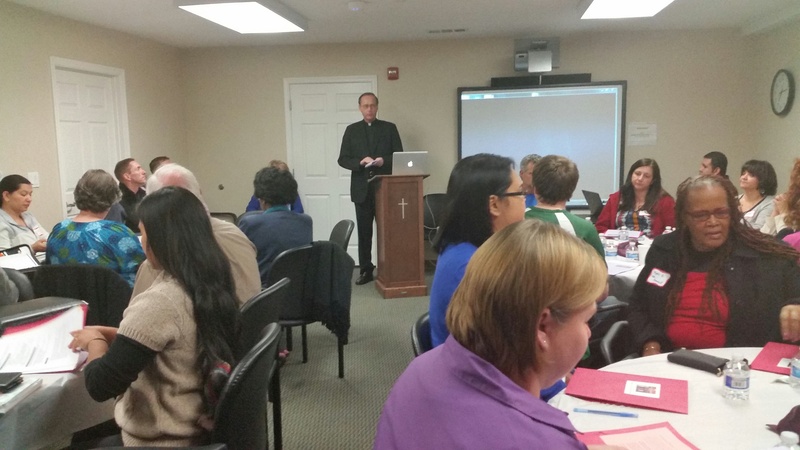 We had over 90 priests and deacons come together for a bible study day Friday, on the Lectionary readings for Lent and Easter. Fr. 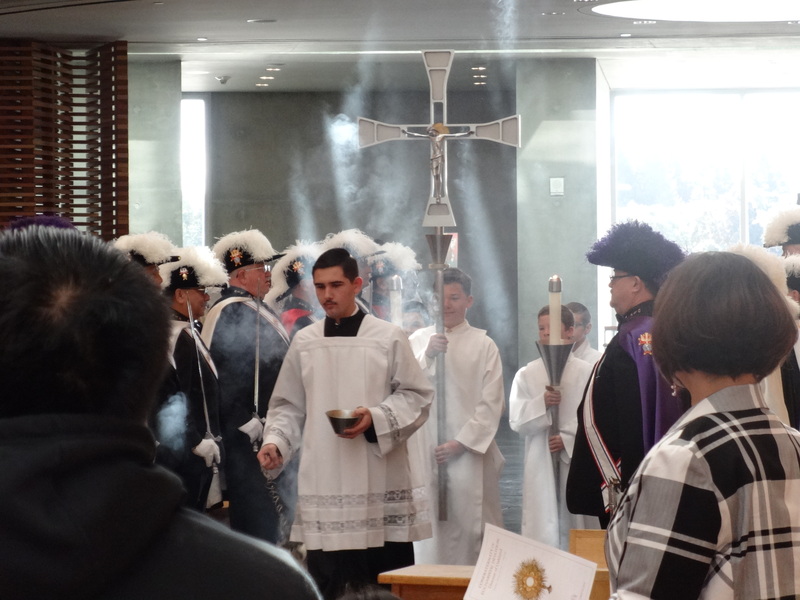 Michael Castori SJ, serving at All Saints in Hayward, was our speaker and teacher. I’ve known Fr. Michael since the 1980s when he was working as a Jesuit Volunteer Corps lay missionary in Micronesia, and we’ve been friends ever since. He has since become a Jesuit priest, and got his doctorate in Biblical Hermeneutics at Cal Berkeley. It was absolutely enlightening to hear Fr. Michael open up the scriptures for us. Later that day we had a lovely pot-luck dinner Campaign reception at Santa Maria in Orinda. I met some very kind parishioners, many of whom have been in the parish since the 1940’s and built the present church and school. Fr. George Mockel pastors this parish, as well as serving as our Diocesan Vicar General. Saturday morning I celebrated Mass for the Diocesan Confraternity of Eucharistic Devotion (CEDDO). 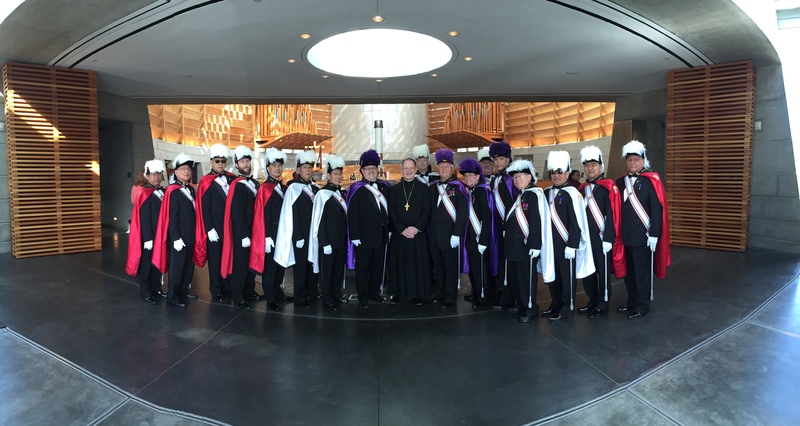 We had a full honor guard from the Knights of Columbus, and the Cathedral Children’s Choir sang the Mass, dressed in their new robes. I have never seen choir members so happy to be singing at Mass as these young people. Our CEDDO group, through their prayer and adoration of Jesus in the Blessed Sacrament, intercede for us all, and call down many graces from heaven on our diocese. Thank You, CEDDO members! Ralph (CEDDO Moderator) and Brigitte DeSimone. Brigitte is very proficient at avoiding the camera! The next day, after the two Masses and receptions at St. Bonaventure, I went to St. Isidore in Danville to celebrate Mass for the Italian Catholic Federation. Following Mass we had a wonderful (dare I say “Italian”) dinner: salad, pasta, roast pork, roast potatoes, green beans, and for desert …………………… Tiramisu! (I gave everyone a dispensation). The ICF presented me with a Spiritual Bouquet which included over 2,800 Masses offered for my intentions, plus two checks for our Seminary fund. Thank you! Photos: Msgr. Daniel Cardelli Monday is supposed to be my day off, but the Naval Order of San Francisco had repeatedly invited me to be the speaker at their monthly meeting. The Naval Order is composed mainly of retired Navy and Marine Corps officers and senior enlisted leaders. I served on duty with many of the members who are from the East Bay when I was assigned to the Navy Reserve Center in Alameda in the 1990’s. I spoke about the changes taking place in the military to accommodate religious practices: e.g. Sikh members of the US Army now have permission to wear their turbans in lieu of berets or campaign covers. Lots of heated discussion followed.